Bicycling is healthy and good for the environment. In Germany, it's also a standard form of transportation. How does it get that way? Not by happenstance. It's cultivated. My kids just finished Bike Week at school (yes, they're still in school—they don't get out for the summer until the end of July). Every year, the 1st through 4th graders have Bike Week. They take their bikes to school and practice riding during class, including a challenging slalom. Kids who don't own a bike get to use bicycles and helmets provided by the school. There is also bicycle theory, including traffic rules and safety tips. At the end of 4th graders' Bike Week, the children are granted their Bicycle Driver License. This is a big deal. By this point, they've been working toward it for four years. 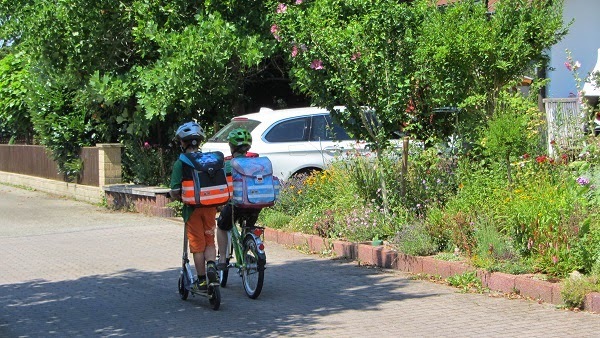 Having their Bicycle Driver License means they are allowed to ride to school from now on. No more using a scooter like the "little" kids. What do you think of Bike Week?